unions organizations that represent professionals in the motion picture industry (e.g., directors, actors, writers, etc. ), and help those individuals negotiate contracts, receive recognition, pursue rights, protect interests, etc. 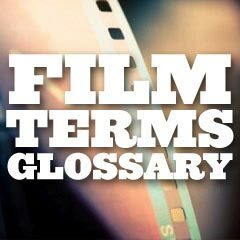 ; aka guilds Examples: DGA (Directors Guild of America), WGA (Writers Guild of America), SAG (Screen Actors Guild), ASC (American Society of Cinematographers), etc. vamp a femme fatale or woman with a bad reputation, usually seductive and scheming in nature or behavior. vaudeville a stage variety entertainment show, featuring a series of short acts - songs, dancing, acrobatics, comedy skits, and animal acts; it was highly popular in America from the late 1880s to the 1920s, when it became overtaken by sound films and radio; most of the early film, radio and TV comedians found their start on the vaudeville circuit. video nasty a British term from the 1980s that refers to a select group of ultra-violent videos (low-budget films produced in Italy and the US) that were considered highly objectionable and to be regulated Examples: 72 separate films appeared on the classified list of "video nasties," 39 of which were successfully prosecuted. Films included Blood Feast (1963), Cannibal Holocaust (1980), The Evil Dead (1981), Faces of Death (1980), I Spit On Your Grave (1978), The Last House on the Left (1972), and Tenebrae (1982). vignette a scene in a film that can stand on its own; also refers to a masking device, often with soft edges. walk-on a minor role consisting of a single, brief appearance on the screen, usually not appearing in the credits and without dialogue; contrast with extras, bit parts, and non-speaking roles. walk-through the first rehearsal on the set, to figure out lighting, sound, camera positioning, etc. in early film production, an individual on a film set's sound stage who was employed to make sure all noises were "shushed" before filming. The whistleman would blow on a whistle just before the shooting of a take commenced, to make sure that the set was quiet and that extraneous noises near or outside the studio set were silenced. wig-wag a red warning light located above each entrance-exit door on a film set sound stage, designed to flash (with a buzzer sound) to indicate when shooting commences or ends; also known as "red-eye"
Example of a wipe right, often used in various Star Wars films.